Currawong’s aerospace grade electronic speed controller provides high power, high reliability brushless motor control for UAV power systems. The high-speed CAN interface integrates easily with a wide range of autopilots. 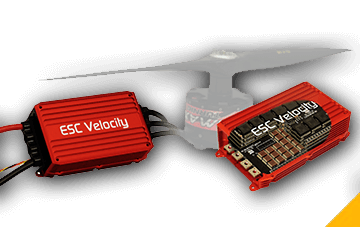 The ESC Velocity is designed to handle the ever-increasing power requirements and provide a level of reliability and traceability required for UAV applications. With 10kW of peak power, the 18S ESC Velocity has been designed to deliver more power to the motors. The voltage range supports battery packs up to 18S (High voltage version), reducing current losses and allowing motors to operate more efficiently at high voltages. The ESC Velocity incorporates a true hardware interlock which provides guaranteed motor shutdown for improved operator safety. The CAN interface operates independently of the interlock, allowing for preflight checks with complete confidence in the safe status of the ESC. Extremely low impedance MOSFET switches with impedance matched drive circuitry means that the ESC Velocity runs cool even when operating at maximum load. When running at part throttle, many ESCs exhibit very low efficiency and extremely high amounts of energy are wasted as heat. Often complex cooling strategies must be employed to minimise overheating and failure. Reduced cooling requirements means easier airframe integration and increased flight endurance. High speed glitch-free control is provided with the CAN interface to the ESC Velocity. This interface not only removes the requirement of having individual signal wires for each ESC running to the autopilot, it also allows the avionics systems to have real-time feedback on each of the motors. Real-time telemetry data including motor RPM, current, voltage, motor temperature and vibration allows complete system health monitoring. A unique low impedance ceramic capacitor array outperforms electrolytic capacitors, which typically suffer from performance issues at altitude and can degrade over time. The ESC Velocity also comes with a fully isolated PWM command input which provides customers with a simple migration path for applications where CAN is not yet fully implemented. Currawong is currently developing a smaller slimline version. Please contact Currawong for more details on the status of the slimline ESC.